Autumn, considered by many to be the most beautiful of the seasons in the Mid Atlantic and North-East. It is a season recognizable from space by the rich paint like smears of red, bronze, orange and yellow. The earth is spinning faster, helped by the 40 billion metric tons of falling leaves moving closer to the axis of the earth. The increased angular momentum from this causes the earth to spin with less resistance. 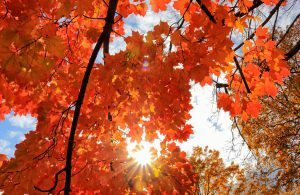 Two of biggest contributors to the iconic fall color of the northern hemisphere are Sweet Gums and Sugar Maples. Moon Nurseries carries a broad and mature inventory of these bodacious beauties. Thanks to native Americans showing colonists how to tap trees, maple syrup is now a multi-billion dollar industry. 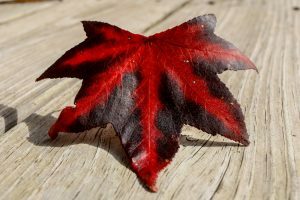 Sugar Maples tolerate a broad range of climates, growing well in USDA plant hardiness zones 3 to 8 and can survive when temperatures plummet to -30 °. 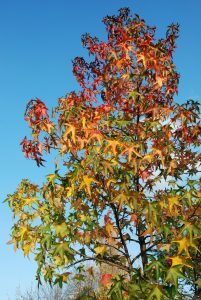 Acer saccarum ‘Fall Fiesta’ grows symmetrically and can reach heights of up to 60 – 75 feet with a girth of 30 – 45 feet. It prefers soil that is well drained, slightly acidic and moist. Full sun is preferred and the acer saccarum produces inconspicuous flowers that give way to 2 winged samaras as they fall. The gray brown bark and is deeply fissured and the 5 lobed leathery leaves are a glossy dark green before fall. 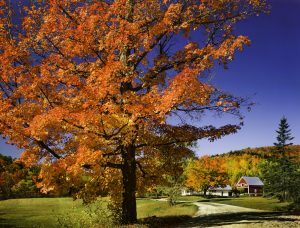 Sugar maples bring forth an ample bounty, from rich maple syrup to unparalleled fall presence in the deciduous class . Fall Fiesta is known for it’s vigorous growth, and is resistant to many diseases but can be susceptible to leaf scorch, verticillium wilt, tar spot and anthracnose. It is intolerant of drought, salt and air pollution. With it’s quirky profile, the ‘Slender Silhouette’ styracicula is a tree that answers the plight of the countless gardeners running into the inevitable circumstance of too many trees, and too little space. Though the root system will grow to that typical of most sweetgums, spreading out beyond what one might think from based on the appearance of the tree. A low maintenance, showy tree that reaches heights of up to 50 feet tall, with a shockingly compact horizontal footprint of 5-7 feet, the Slender Silhouette is a tree that has no equal. It thrives in plant hardiness zones 5 to 9 under full sun. Slender Silhouette tolerates a broad range of soil types is resistant to most diseases and pest problems. Occasionally, they can be subject to bleeding necrosis, which will make the infected tree appear as though a can of oil is dumped upon it’s bark above the soil line. The falling gumballs of Liquidambar styracificula can become a painful nuisance to the soles of bare feet and other tender body parts who come into contact. When ejected from a mower the gumballs take on a mace like quality… Fortunately, the narrow diameter of ‘Slender Silhouette’ makes the area the gumballs fall in the smallest of all varieties of liquidar styracificula.